With Local Prediction of the Solar Eclipse, you can find local predictions of the phenomena. You can also check long term data with Eclipse / Transit / Occultation Database. Solar Eclipse occurs when the Sun and the Moon gets nearly on the straight line and the Moon passes across the disk of the Sun. Since the orbit of the Moon tilts (about 5.1°) against the orbit of the Sun, solar eclipse does not happen on every new moon when the Sun and the Moon are in the same direction. Solar Eclipse occurs at New Moon near the nodes. Caution! When you observe the solar eclipse, you MUST NOT directly look at the sun. Otherwise, you might loose your eyesight. Inside the penumbral shadow cone, you can see Partial Eclipse, and inside the umbral shadow cone, you can see central eclipse. When the Moon is near, the whole disk of Sun is covered by Moon (Total Eclipse). and when the Moon is far, the disk of Sun is not fully covered and looks like a ring (Annular Eclipse). Sometimes the location on the Earth can be a factor for the phenomena (Annular Total Eclipse). During total eclipse, we can observe mysterious scene. 1) It gets dark, 2) planet and bright stars appears in the sky, 3) Diamond Ring, 4) beautiful corona. We use the term "central eclipse" as a generic term for total, annular, and annular total eclipses. Though "central eclipse" can be limited to those where the center of the umbra overshadows the Earth, such strict definition is inconvenient since there are some non-partial eclipses where the center of the umbra never touches the Earth. As for general circumstances, strict definition is applied since it is useful for simply describing circumstances of eclipse. Not everyone can see solar eclipse. Eclipse Map shows the area where the eclipse is visible in red lines. You can say that it is the passage of Moon's Shadow. Because the Earth is round, there are several patterns in eclipse maps. Inside the Path of Central Phase, you can see central eclipse. The mark "*" shows the position of the center of the shadow of Moon. Outside of the path, you can only see partial eclipse. At left and right side of the Map are the sunrise or sunset lines. Inside the lines, the Sun rises or sets during eclipse. In Reki Yoko, we use V + 180° rather than V at the beginning and at the end of total eclipse. At the beginning of the total eclipse, V + 180° shows the direction of the last visible part of the Sun, ant at the end, it shows the direction of the first visible part. V : Direction of the center of Moon with respect to the center of Sun, measured counterclockwise from zenith, i.e. V = p - q.
Dist. 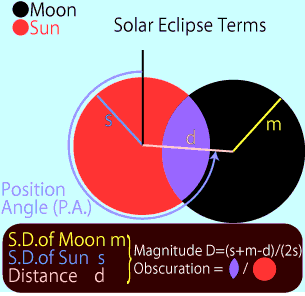 (d) : Angular distance between the centers of Sun and Moon. Obsc. : Obscuration = Percentage of surface area of Sun covered by Moon.